"Please miss, may I go to the toilet?" must be one of the most common questions asked in a primary school classroom! But for the 46 children who attend Tupac Amaru primary school in Conchaccota in Apurímac access to a toilet wasn't a option. Both children and teachers in her school used to miss lessons because of sickness caused by contaminated water. Taps are often frozen in winter, making hand washing impossible. 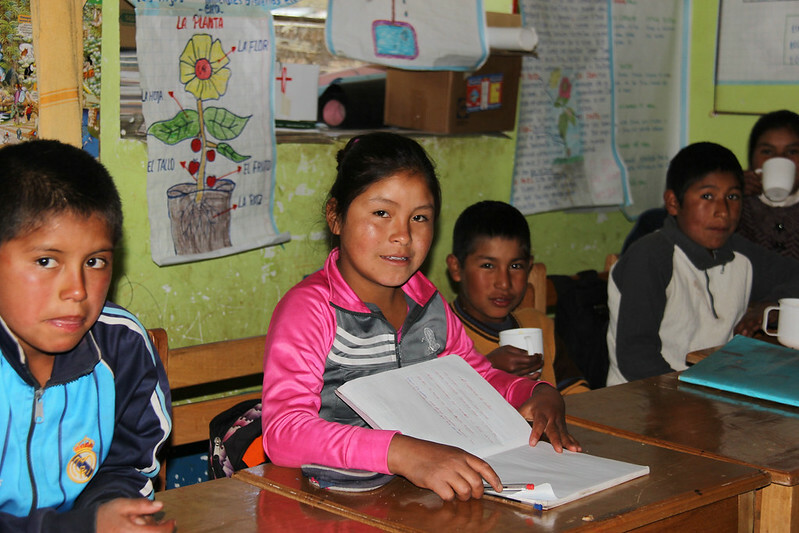 Poor educational achievement is a key factor limiting development in rural Andean communities. Many areas lack basic services and suffer low learning achievement in students and high rates of teacher and student absenteeism. And with few opportunities to access information and communications technology these communities remain isolated from many of the advances in modern education and students are at a disadvantage in continuing their secondary and higher education. Teachers in these rural areas can’t take advantage of digital resources developed by the Peru's Ministry of Education. Now along with seven other schools in the region, Tupac Amaru pupils are part of a project to improve learning, through access to energy services, safe water, sanitation, and information technology. This will improve educational conditions leading to a brighter future for these communities. Working with teachers like Fryda, is key to the project’s success and she is keen to collaborate in all aspects of the project. The water and ecological sanitation technologies which are being installed have been specifically designed for remote areas like this in the high Andes. They are easy to maintain so that the community will be able to manage the facilities themselves. The school now teaches health and hygiene. A school without clean water or sanitation is a distant memory for Fryda. Children in Tupac Amaru finally have the school facilities they deserve and she can’t wait to see their educational outcomes improving.